Imagine producing the athletic performance of your life and there was no-one present to measure and record it for posterity. It’s the stuff of nightmares for every level of athlete, from the back-of-the-pack Saturday morning parkrun shuffler to Olympic 100m finalist. Athletics would not exist without the army of dedicated officials who time every race or measure every jump and throw. As volunteer official Richard Jenkins said at the recent Welsh Indoor Athletics Championship in Cardiff: “I’m here to allow athletes to achieve what they want to achieve in their dreams. The event, held at Cardiff’s National Indoor Athletics Centre, featured the extra logistical challenge of incorporating a combined events international match. The event attracted hundreds of athletes. Not only did they come from Wales, but all over the United Kingdom. Tech manager Chris Price hepls ensure a successful event by making sure these hurdles are the only obstacles in the athletes’ way. And that’s before you consider the dozens of international team members from France, Spain, the Czech Republic and Poland taking part in pentathlon and heptathlon events, which required a whole different scoring system of their own. As well as accommodating the needs of all the athletes, the officials also had to cater for the extra requirements of broadcasters and media, who also needed access to the track and field areas. The man tasked with meeting some of those challenges was the volunteer tech manager for the two-day event, Chris Price. An IT manager by day, Chris spends a large proportion of his weekends and evenings travelling up and down Wales and further afield helping ensure athletes have everything they need to perform at the very highest level they can in competitions. In between precisely laying out hurdles on the track and setting up long jump measuring equipment, Price took five minutes out of his hectic day to explain his duties and why he loves carrying them out. “When you’re filling in as tech manager it’s a higher level of responsibility associated with delivering the event,” he said. “You make sure that everything competition-wise is in place. Today is a level up again with the British Athletics involvement in the combined events international. It’s added that little bit extra in terms of the duties tech managers do within Wales normally. “It can be a little stressful at times, especially in my case this weekend. On Friday morning I was in work and then came down to set up on Friday afternoon. On Friday evening I was here until 10pm. “I was here again at 8am on Saturday morning and we were the last to leave last night at around 7.30pm, trying to get things in place ready for this morning when we were here at 8am. Enjoying it is the key factor for Chris, who got involved in officiating after his children started to compete in athletics. “If I didn’t enjoy it I wouldn’t do it,” he says. ” I’m a volunteer at the end of the day. I never really had the background in athletics. The only athletics involvement I ever had was doing the cross country in school. I was OK at that but I never really took it on any further. 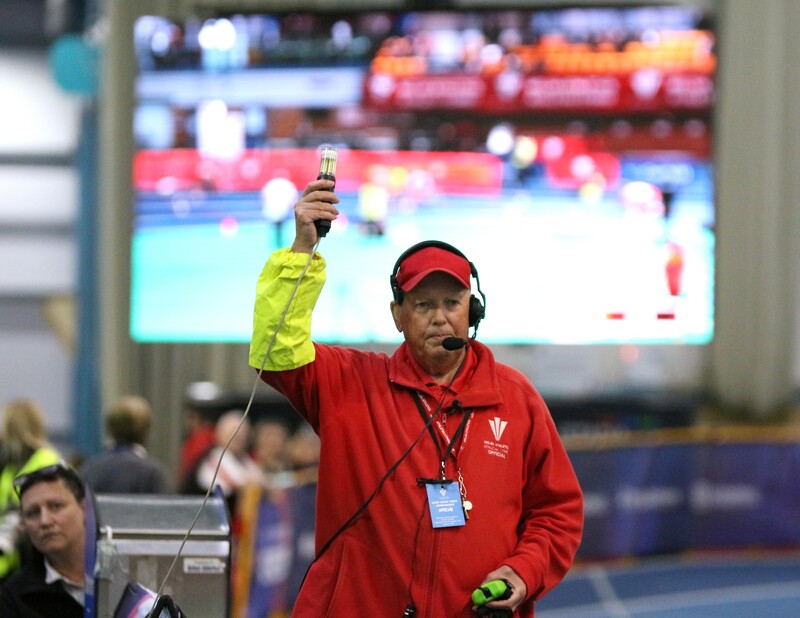 Price’s involvement in athletics has led to him officiating from grass roots meetings to high level events such as the Anniversary Games at the Olympic Stadium in London and last summer’s World Junior Championships in Finland. He says athletics is dependant on a dedicated group of volunteers, like fellow official Richard Hughes, who has officiated at the Olympics, but still offers his experience and expertise at the age of 77. Chris says: “There is a core group of officials who you see week in, week out. You’ve got guys like Richard who has come up from Exeter this weekend. “He was Welsh based previously, but he’s still got that alliance to us and comes back up each time and he makes that trip up from Exeter each time. We’ve got people who come from the Midlands and for this event we’ve got them from further afield as well. “It’s a big commitment, obviously they get expenses to come down, but the Welsh junior leagues, the Welsh senior league, the Youth Development Leagues all need key officials who will referee the event and so on. So throughout the summer, I’m out and about every weekend. Keeping a close eye on the finish of a 60m sprint. Whether would-be volunteers want to rake the long jump pit at local club events or officiate at international meetings, there is something for everyone in athletics, say Chris and Richard. And there is plenty of demand for new blood on the officiating list. Both men would urge anyone interested in being an official to get involved. Chris said: “Even though I didn’t have that background in athletics, I get a lot of enjoyment out of aiding others to achieve their best. Measuring and raking in the long jump pit. Chris said: “We are bringing on the lesser experienced officials now. I got my level four a couple of years ago and I’m now starting to mentor other people and bringing them through. You have officials at have all different levels of what they want to achieve in the sport. “You have people who are just happy to help their clubs out, because they have got to provide officials for events. Then you’ve got the ones who maybe have a little bit more ambition in terms of they want to officiate at Welsh Championships because they feel they can provide something there. “Then you’ll have the ones who want to get onto the national list, the really driven officials. My daughter is keen to hit the nationals. That’s why at 19 she is now a level four official and she has worked really hard to get there. Just like with the athletes themselves, the sky is the limit where talented and ambitious officials are concerned, says Chris. “My son worked in photo-finish for a little while and got his level two. He was doing his apprenticeship at the time, he’s qualified at that but at the same time he was involved in athletics, quite often leading the teams. “He has now got involved with Seiko on the photo-finish teams and he’s done the World Championships because they operate the kit there and that’s what he really wanted to be doing, so he’s done the Bahamas, Moscow, Beijing . “For him, it’s been a starting point but he has gone on and is now getting paid for it, rather than being a volunteer. Officials keep an eagle eye on Wales and Great Britain international Ben Gregory in the long jump. Anyone wishing to find out more about officiating, the various qualification levels and opportunities available should go to the Welsh Athletics website’s Get Involved section. I once was officiating at the masters championships and a national throws coach said we do no need officials. He said that they could do it themselves. I nearly packed up officiating after this coment. We are under valued and most people think we are paid. At the highest level officials are not looked after very well and this is getting worse. I’ve been officiating for 4 years having been an athlete 30 years ago I wanted to get involved. Chris Price has been an inspiration and great support, as has been Sue Alvey who is my mentor. I’m now at level 3 and hope to progress further but i am thankful to the officials I have met, both level above and below because without them I would not be where I am now and the athletes would be getting a poor experience. Welsh Athletics needs to be much more proactive in recruiting officials….officiating is so rewarding.